Everybody who’s ever driven past a farmer working in a field knows that farming is hard work. What you might not know is that farm finances are tricky, too. Cash flow varies from one year to the next with crop conditions and commodity price fluctuations. After a good harvest, a farmer might be tempted to overspend on equipment such as tractors and combines in hopes of growing into them, only to find in leaner years that the assets aren’t being fully utilized and are tying up too much capital. As with other businesses, a farmer wants to maximize profits while minimizing costs. When the hard work of farming is done right and the finances managed wisely, a farm generates profit which the farmer then wants to put to work with the same attention to detail used in operating the farm. Just as with the operations of their farms, farmers want to maximize their investing profits while keeping expenses as low as possible. The last thing a farmer needs is another set of risks to manage and a new set of headaches from the financial markets. Researching how best to handle his family’s profits led Iowa farmer Will Axmear to buy The Neatest Little Guide to Stock Market Investing in early 2014. He’s the fourth generation to work the land. Will’s great grandfather bought 240 acres for $100 per acre and later sold them to his grandfather for $50 per acre when he got married in 1939. The land looks much the same today as it did back then, except for the addition of hog buildings. 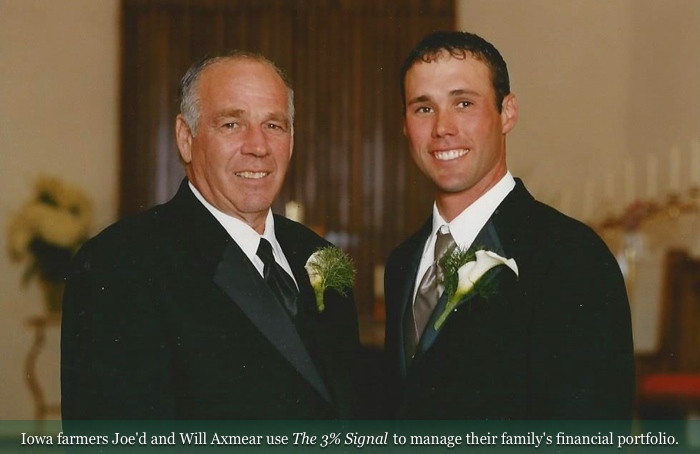 The Axmear family grows corn and soybeans; raises hogs; and operates a seed corn harvesting service and a manure-hauling business. Their biggest financial challenge is price fluctuation in the grain market, which produces profits in some years, none in others, and occasional losses. The Axmear family name has an interesting story. It originated in the 15th century as Eysema in the Friesland province of northwestern Netherlands. In the 16th century, it became Eisma, which means “son of Eisse,” the latter being a Dutch first name. In the early 1800s, an Eisma man immigrated to the United States and worked for the railroads. Family lore has it that a bank clerk consistently misspelled his surname as “Axmear,” and it stuck when the man changed his name to it for ease of collecting pay and managing bank accounts. Following the death of his first wife, the man remarried and migrated west, thereby bringing the Axmear name to the area around Keswick, Iowa, where Will and his family operate their farm. Will’s father Joe’d (correct spelling, pronounced “Jody”) ran the farm business as a partnership with a family member for many years. He managed the farm while his partner handled the money, which included a stock market portfolio. After dissolving the partnership, Joe’d found himself in charge of a portfolio he knew nothing about. He turned it over to a manager at a financial firm in Cedar Rapids, but the manager quit the business and passed the account to a younger person. This seemed like a perfect opportunity to research others ways to manage the money, and that’s what prompted Will to start reading stock books. Meanwhile, Joe’d contacted several financial management firms around the country about taking over his sizable portfolio. He received fee quotes ranging from 0.75% to 2.18%. He was leaning toward a firm in California, whose commercial he saw on television, when Will looked more carefully at the existing account and discovered that his dad was overpaying, and getting ready to do so again. Will told Joe’d about The 3% Signal, or 3Sig. He had seen it in action in Tier 1 of The Kelly Letter and read articles about the system in the letter prior to the publication of The 3% Signal book. He told his dad, “It would enable us to manage the portfolio on our own with very little time spent and much lower fees.” Joe’d was interested in this. This appealed to Joe’d for a couple of reasons. First, he’d always kept the stock market at arm’s length, never losing sleep over it while he focused his energy on running the farm. It wouldn’t be hard to maintain an indifferent treatment of the market after taking over his own account. Second, he wondered how much worse it could be than what he’d already endured. He’d seen business partnerships come and go, bought additional farm acreage that dropped to half the value he’d paid, and suffered a 50% loss in the stock market when professionals were in charge of his portfolio. “I think I take things in stride,” he says when asked how he responds to hardship, and he figured he’d be able to take his own portfolio management in stride, too. “An investment manager is like a farm manager,” Will told his dad that day in the field, knowing this analogy would strike a chord with Joe’d, who can’t stand farm managers. A farm manager is somebody who’s hired to manage a farm on behalf of its owners or alongside the owners. The manager oversees employees, plans production targets, creates a marketing plan, tracks equipment, and so on — basically runs the business. Based on his own experience and what he’s heard from other farmers, Joe’d thinks such managers are useless because they cost a lot while adding little value to a farm. In some cases, they even worsen the farm’s results. “Yep,” said Will, “and so are some investment brokers.” He said The 3% Signal would improve the performance of the Axmear family portfolio and cost far less, “and simplify things,” he added. This last point was not a small one. Over the years, Joe’d had collected a myriad of positions based on ideas from advisors and the media. He owned shares of Allstate (ALL), Boeing (BA), super market operator Groupe Delhaize (DEG) (owner of the store brands Food Lion, Bottom Dollar Food, and Hannaford in the United States), McDonald’s (MCD), Procter & Gamble (PG), and Wal-Mart (WMT), in addition to a wide assortment of mutual funds ranging from large-company stock funds such as ClearBridge Value (LMVTX), to international stock funds such as American Century International Growth (TWIEX), to hybrids such as Putnam Fund for Growth & Income (PGRWX), and even a sector fund: Invesco Energy (IENAX). Portfolios like the one Joe’d’s advisors assembled for him are common. American investment accounts are filled with them. The problem with such hodgepodge approaches is that they’re overly diversified, which causes them to lose to a focused stock market fund while charging exorbitant fees. For example, according to Morningstar, over the past ten years ClearBridge Value returned 2.4% annually while the S&P 500 returned 8%. For the service of losing to the unmanaged market, ClearBridge charges an expense ratio of 1.8%. Other funds in Joe’d’s portfolio charge similarly high fees: 1.2% at American Century International Growth, 1.0% at Putnam Growth & Income, and 1.2% at Invesco Energy. On top of these fees, Joe’d paid his advisors, too. Will wanted to put an end to this. He showed Joe’d how The 3% Signal system works to extract additional profit from the stock market’s most profitable segment, small-company stocks, at a fraction of the expense charged by Joe’d’s current funds. Over the past ten years, for instance, iShares Core S&P Small-Cap (IJR) averaged 9.2% annually while charging well under 0.2%. Its current expense ratio is just 0.12%. The only other fund involved in the signal system is a bond fund for safety and dividend income with a minority of the capital, and such funds are even cheaper. For example, Vanguard Total Bond Market (BND) charges a mere 0.08%. Because The 3% Signal is self-managed with only four check-ins per year, there are no advisor fees, either. With their research complete and their minds made up, the Axmears declined overtures from other financial management firms in favor of starting their new 3Sig plan at a self-directed brokerage account, which offers free trading of the only two funds their plan will use. Another cost savings! 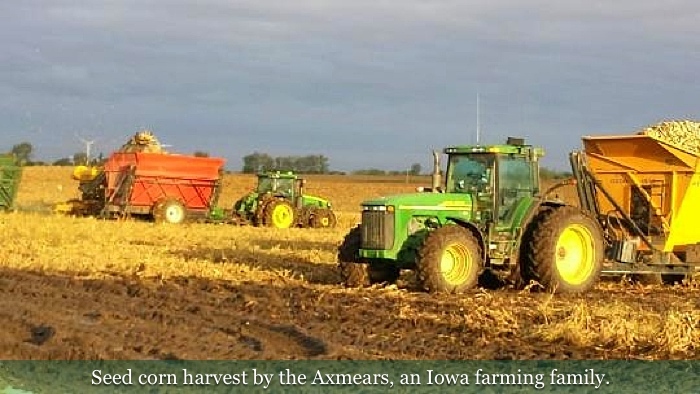 With their portfolio safely on autopilot toward higher returns at a much lower cost, the Axmears are free to concentrate on what they do best: run the family farm. “It’s good to check off this part of our financial picture that’s been eating at me,” Joe’d said. This entry was posted in 3Sig and tagged 3Sig Stories. Bookmark the permalink. Both comments and trackbacks are currently closed. Looks good to me. I have been on my own for about 5 years after letting go a few advisors (brokers) who often made more than I did on my investments. I, too, was a farmer in grapes for 25 years and didn’t have the time to do it myself. It’s my job to finance my retirement now and make sure our money continues for lifetimes. Axmear better hope no farm managers read this article! Might make negotiating new leases a little awkward. Ray, a very good point. Joe is at that point in life he doesn’t have to negotiate farm leases anymore. I needed to find something that would relate and strike that chord with him. I understand there are farmers who deal with managers and have great relationships with them. I used it as a generalization. Convincing him took some time, but it was effective and worked! Jason has changed our lives. You are going to increase U.S. unemployment and underemployment when folks find out that 0.12% is less than 2 to 3% per year. Of course, for the larger amount you receive recommendations like buy fixed annuities that create huge commissions for the salesperson. I especially enjoy the free luncheons and dinners these “advisors” hold in trying to extract my money into their “care.” Oh well, such is freedom of choice today! You can always choose another advisor but most don’t! In addition to The 3% Signal book, I would encourage Will to subscribe to The Kelly Letter. Kelly’s letter will add some very valuable insight into the dynamics of world politics, technology and scientific advances, and manufacturing processes that over time will give you insight into Jason’s picks for his Tier 3 plan. No I’m not a paid employee or back bencher for the Letter. I’ve been an avid reader north of the border for several years, enjoying Jason’s timely topics he puts forth in the Letter. I hope, no, I know you’ll enjoy it too. Yep, his letter is great! Glad you read it as well. Thank you Jason Kelly and Will Axmear. I found the story enjoyable to read and it is nice to hear a success story. There should be a follow up two years from now. That’s a good idea, Chris.